Consider this method when most of your men are on your side of the board; a handful of isolated men further back is ok. In this case, chances are that you have a prime of some kind, maybe a broken one; this is your cluster, and assume it is a 15-man cluster; ignore the isolated men for now. 1. 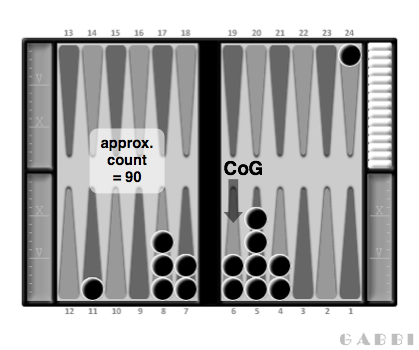 Estimate where the center of gravity (CoG) of your cluster is. This is the point where a roughly equal number of men can be found on both sides of that point. 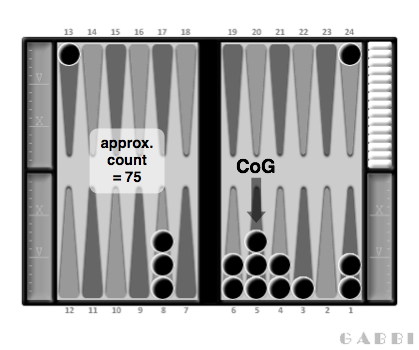 Chances are that the CoG will be your 6-point, maybe your 5- or 4-point; other points are possible of course, in particular for more lopsided positions. 2. 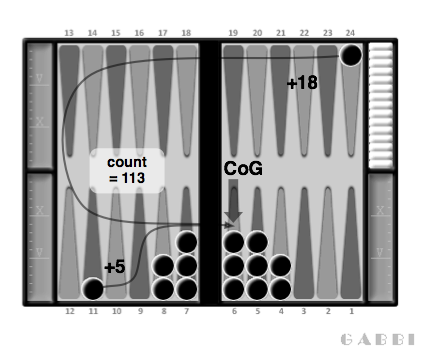 Compute the approximate count by multiplying the CoG by 15. Use neutral shifts; i.e., if you move men N pips forward, move other men N pips backward. This keeps the count unchanged so far. Try to make as few mental shifts as possible. Just smooth out your cluster shape. If neutral shifts are not enough to get a perfectly symmetric cluster, shift the "un-cooperative" men to achieve symmetry, but make adjustments by adding/substracting pips as necessary. 4. Make count adjustments for the isolated men. Add pips for men trailing the CoG; yes, that could be many pips for men in your opponent's infield, or on the bar (don't forget about those). Substract pips for men ahead of the CoG; there should not be many of those men, if any at all; but they may include men already off (don't forget about those). This generally seems a more complex method, but it is easy to master with some experience. It really is not, after some practise you will visualize it instantly. It does not need to be absolutely accurate. Again, with practise it will be. 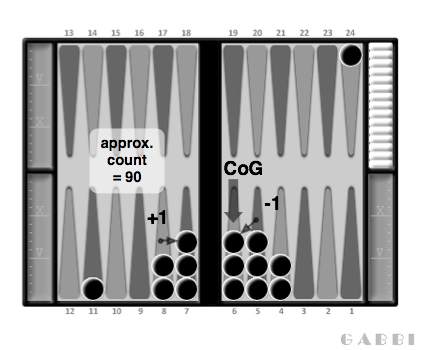 It should be familiar to anyone who is used to counting methods. More often than not, a few symmetric shifts will do the trick. You're not trying to pile up all men on the CoG; you're trying to get a nice symmetric cluster, of roughly the shape of your (possibly broken) prime. Un-cooperative men are likely found at the edge of the cluster; rarely in the middle of it, depending how crafty you are with mental shifting. There should not be many isolated men, therefore not many count adjustments; if there are, you should have used another method. Remember, this method if for late(-ish) positions, like (quasi-)non-contact races and prime battles. It is quite easy to forget men already off: they count as men on your 0-point, you can't just ignore them! They can be part of your cluster if relevant. This may be the case in really late games, with men deep in your infield. If not, they have to be adjusted for as any other stray men ahead of the CoG. It is quite easy to forget men on the bar. It is even easier to remember men on the bar indeed, but forget to count them only for pips until the CoG (and not 25 pips each).